Beautiful and elegant, this White Chocolate Rose Bark with Raisins is an easy treat to whip up and show your Valentine how special they are. Sponsored by Sun-Maid Raisins. February is practically here and you know what that means. Sure, the Super Bowl is days away, but I’m not talking football. I’m talking about every man’s OTHER favorite holiday (snort snort! ), Valentine’s Day. For most people, Valentine’s Day means love, roses, chocolates and champagne. Some couples take it to the extreme, while others don’t give it much thought. In our house, with the kids getting older, it means no more homemade Valentine’s Day cards or class parties. But I still like to make something sweet and special to show my family how that I love them. Of course when we talk about Valentine’s Day, we all think about the classic gift of chocolates and roses. 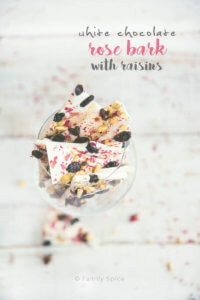 So why not combine them both and give your sweetie something extra-special, like this White Chocolate Rose Bark with Raisins. Chocolate bark is notoriously found during the Christmas holidays, but it has evolved from the simple chocolate and peppermint combination and can be found in numerous varieties all year long. And this chocolate rose bark is perfect for Valentine’s Day. Persians have long been baking sweet treats with roses and rosewater. In fact, you can find rose scented confectionaries all over the middle east. This chocolate rose bark uses dried culinary roses, which you can find online, in middle eastern and asian markets. They really add a pop of color, aroma and sweet flavor to your cookies, cakes and bars. 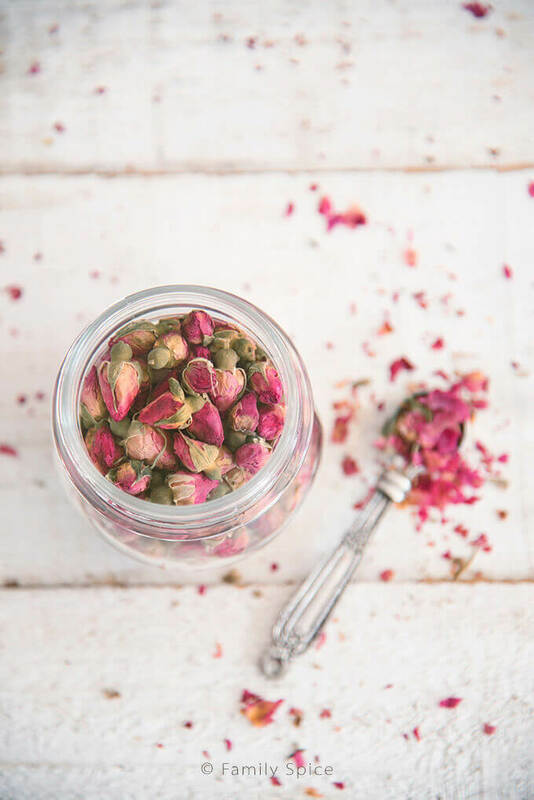 Persians and middle easterners also love baking with rosewater, which you can find online and in middle eastern markets. 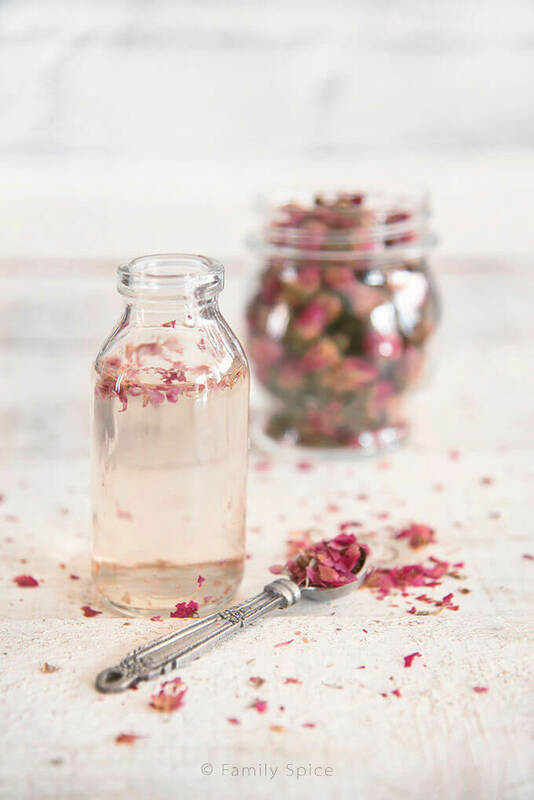 You can also make your own rosewater simply by steeping fresh, organic rose petals in hot water, like a tea. Then you discard the roses petals, and bottle up your homemade rose water. I don’t have any roses in my yard, so I just buy a bottle at my local Persian market. Although bark is simple to make, you do have to be careful when melting white chocolate, as it burns very easily. Also, once melted, you have to let it cool for about 5 minutes before you stir in the rose water, otherwise the chocolate will “seize” and turn into a clumpy mess. And yes, I am totally hanging my head in shame because I was in a rush in my first batch and didn’t let it cool the chocolate. I had to start all over again. If you are intimidated with this step, you can totally omit the rose water altogether. Your chocolate rose bark will still turn out fabulous! 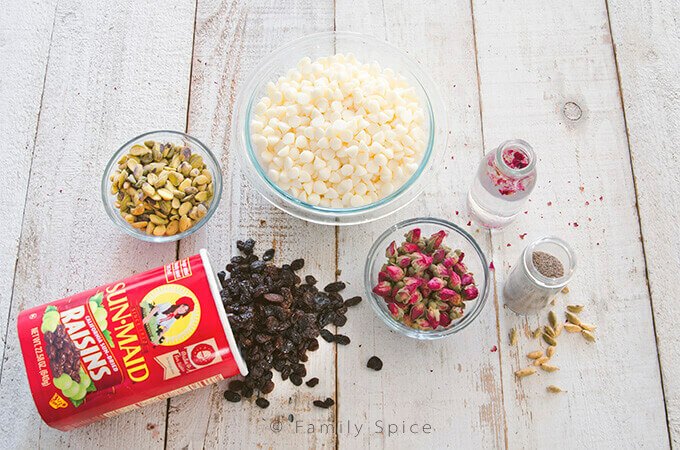 My favorite Persian flavors really inspired my recipes for this white chocolate rose bark: roses, cardamom, raisins and pistachios. It turned out to be one beautiful chocolate bark. I hope your sweetie likes this chocolate rose bark as much as mine did! How do you celebrate Valentine’s Day? 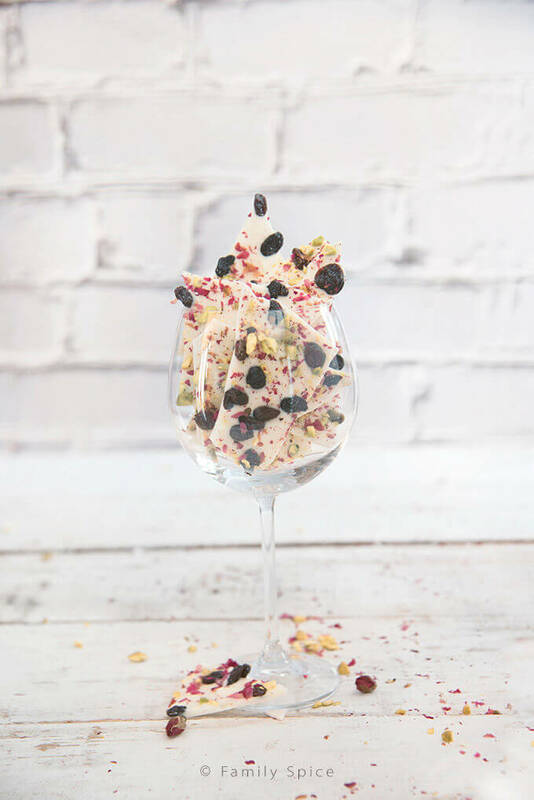 Beautiful and elegant, this White Chocolate Rose Bark with Raisins is an easy treat to whip up and show your Valentine how special they are. Line a baking sheet with parchment paper or silicone baking sheet and reserve. White chocolate easily burns, so watch the temperature and stir constantly. When chocolate is melted and smooth, remove from double boiler and let it cool for 5 minutes. This is very important!!! If you do not let the chocolate cool first before stirring in the rosewater, the chocolate will quickly seize and get clumpy. Quickly pour chocolate mixture onto prepared baking sheet and spread evenly with a rubber scraper. Gently press toppings into the chocolate. Chill chocolate in the refrigerator for at least 2 hours. 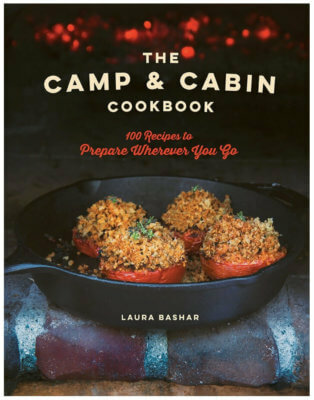 Once completely set, break into rough shards of chocolate and serve. Disclosure: I did receive a stipend from Sun-Maid Raisins to develop a recipe using their raisins. The story I have written is all true, and the opinions are truly mine. If I didn’t like it, I wouldn’t blog about it. This post does include affiliate links. So pretty and a great homemade gift! What a great and interesting homemade treat! This is perfect for Valentine’s Day!